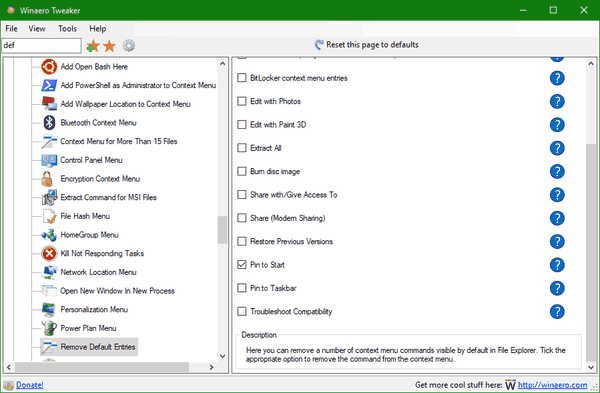 The ability to add the Change Network Location submenu to the Desktop context menu to quickly set your network connection to Private or Public. 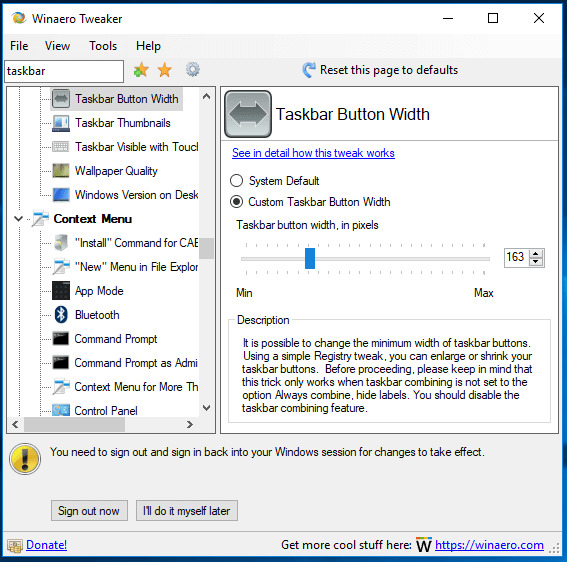 The ability to integrate Snipping Tool to the Desktop context menu.In recent Windows 10 versions, this option will add a submenu with the item to capture a screen region. The ability to add the Control Panel submenu which contains the commands "Category", "Large icons" and "All Tasks". 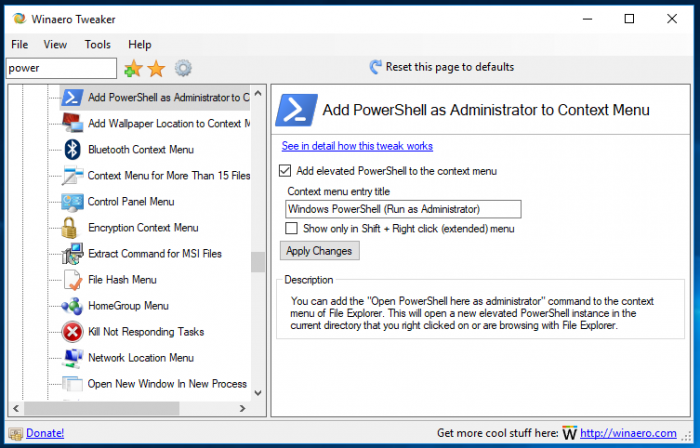 The ability to add the command "Open PowerShell as Administrator" to the context menu of File Explorer. 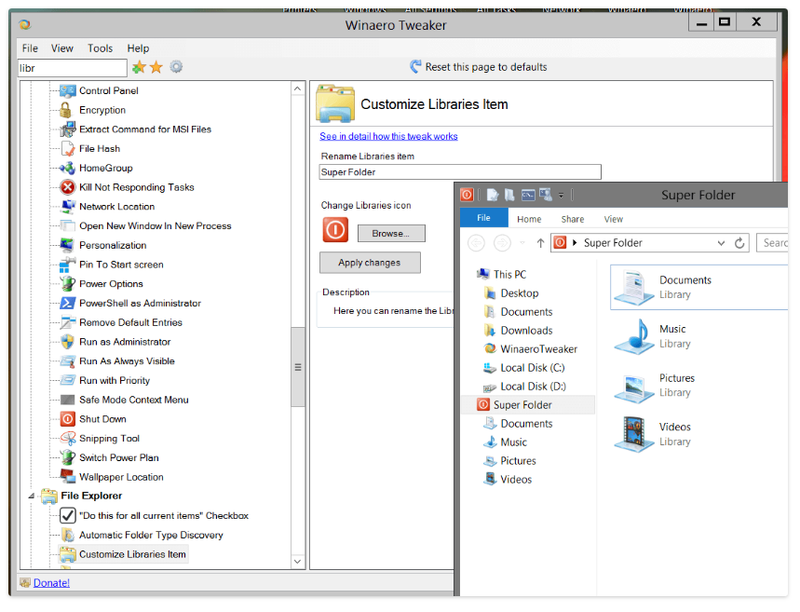 -Give access to (Share with in previous Windows versions). -Share - the modern Share command available in recent builds of Windows 10. -Edit with Photos - also a new command which was added recently to the context menu of image files in Windows 10 Fall Creators Update. Under Network\Reset Data Usage, you can reset the network data usage with one click in Windows 10. I fixed the "Customize This PC" option in the Tweaker app. Now it can remove the 3D Objects folder from This PC in Windows 10 Fall Creators Update. Hey folks, I am VERY happy to announce a new major version of the app. 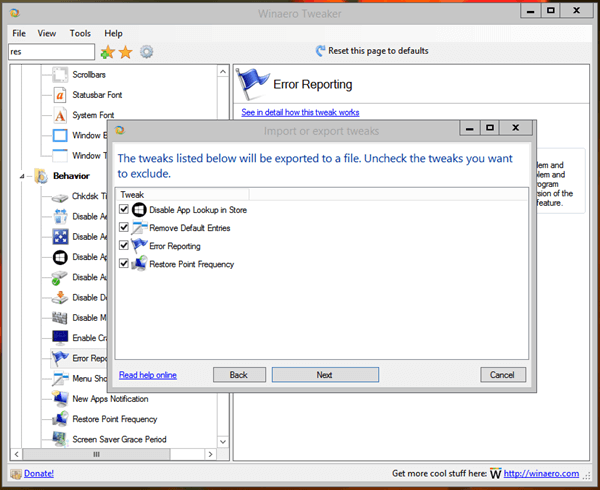 Winaero Tweaker 0.8, the first version which comes with import/export for changes you made! A new wizard can be found under Menu - Tools -> Import/Export Tweaks. 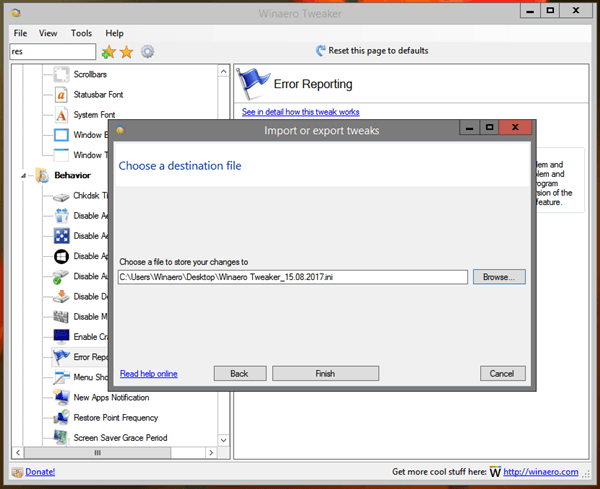 The ability to export and import changes you made with Winaero Tweaker. You can go to the desired Registry key with one click using a new option under Tools. 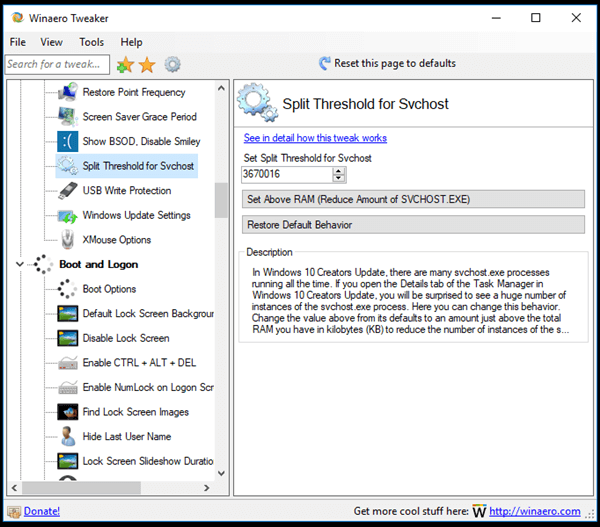 You can configure split threshold for svchost.exe in recent Windows 10 builds. Here are a few things you need to know before proceeding. - upgrade the app to version 0.8. 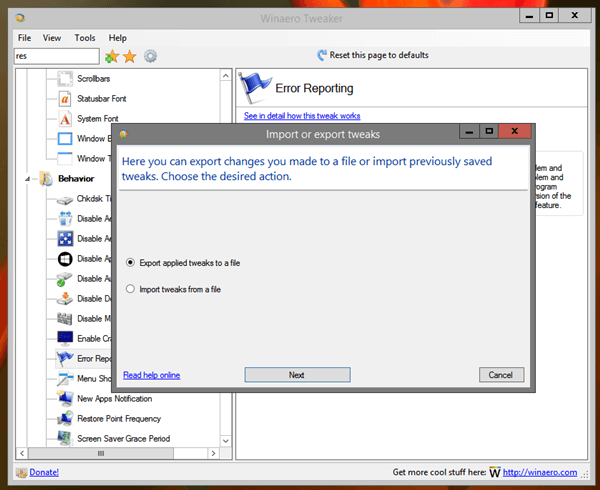 - reset the changes that you have made to their defaults for critical tweaks you would like to export. - export tweaks to a file. You can apply tweaks in one version of Windows, export them to a file, and import them in another Windows version. This scenario is supported. 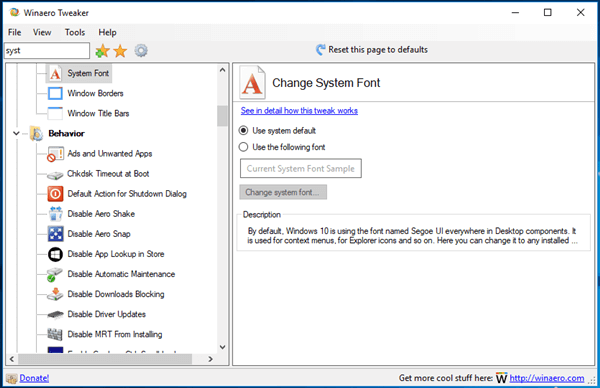 In this case, the app will ignore the Windows-version-specific tweaks and apply only those tweaks which are common between two different Windows versions. Pretty cool, isn't it? If something goes wrong during export or import, the app will place the file WinaeroTweaker.log in the same folder where the ini file with your tweaks is stored. It will be opened automatically so you can review it. Please email me the log file in such situations. A number of tweaks related to advanced system appearance like "System font", "Status bar font" and so on won't be exported. The advanced appearance options are not officially supported in modern Windows versions. Importing them can cause unexpected behaviors in the OS, so I have decided to exclude them from import and export for now. Please consider configuring these options manually when required. 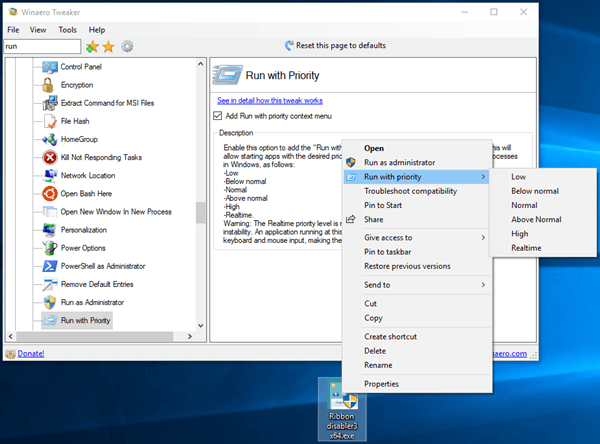 You can add the Run with priority context menu to File Explorer. You can add the Shut Down context menu to the Desktop to save your time (and avoid unwanted apps auto-starting if you are running Fall Creators Update). You can add the Power Options context menu to the Desktop. 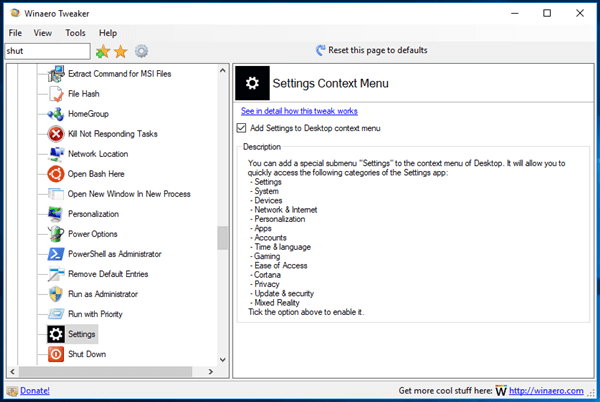 The ability to add the Settings context menu to the Desktop in Windows 10. The App Mode context menu to switch between the light and dark color scheme quickly in Windows 10. 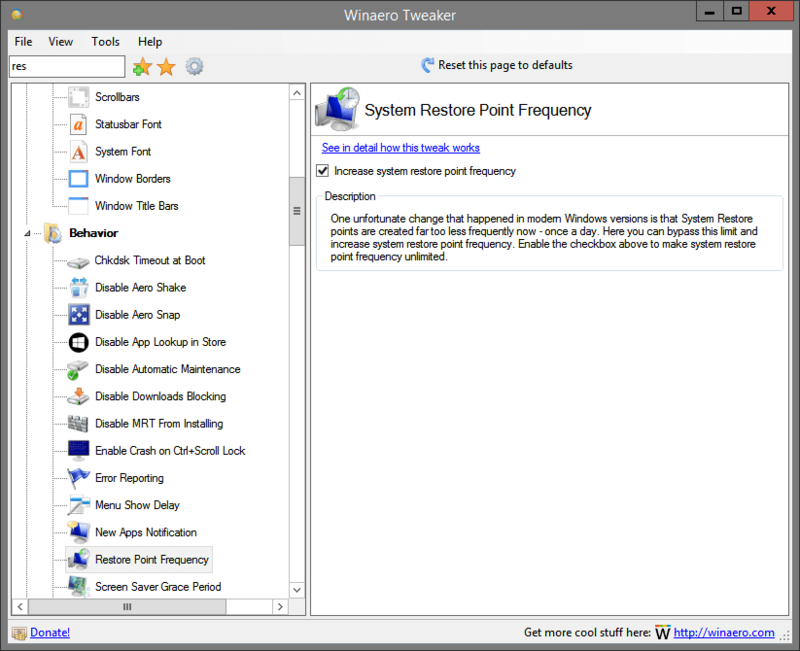 You can change the default RDP port to what you want. You can manage hibernation options in Windows 7, Windows 8 and Windows 10. You can disable the hibernation feature, shrink the hibernation file to its minimal size or set it to a custom size. Also, you can disable hibernation but keep Fast Startup. 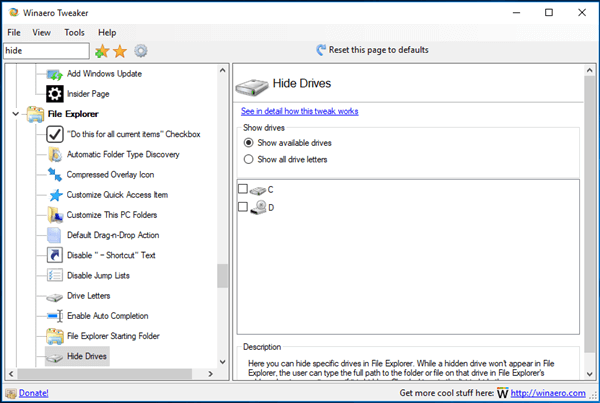 You can quickly hide a drive from appearing in File Explorer. 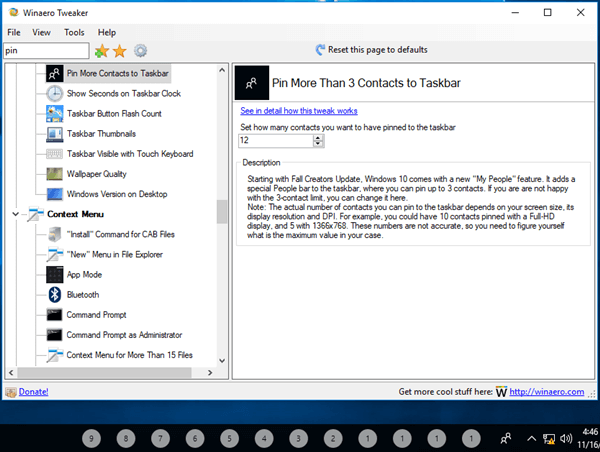 Using Winaero Tweaker, you can unlock the ability to pin more than 3 contacts to the taskbar. You can add the "Personalization" link back to the Control Panel. You'll be able to add both kinds of Personalization links - the Settings app and the classic applet. You can set the desired default action for the classic Shut Down Windows dialog(Alt+F4 on Desktop). You can enable Windows Installer in Safe Mode. This will allow uninstalling apps which were installed from an MSI package. Finally, you can enable the Emoji Panel (Emoji Picker) for all languages in Windows 10. Fixed: The "Command Prompt as Administrator" and "PowerShell as Administrator" menus were not working in Windows 7. 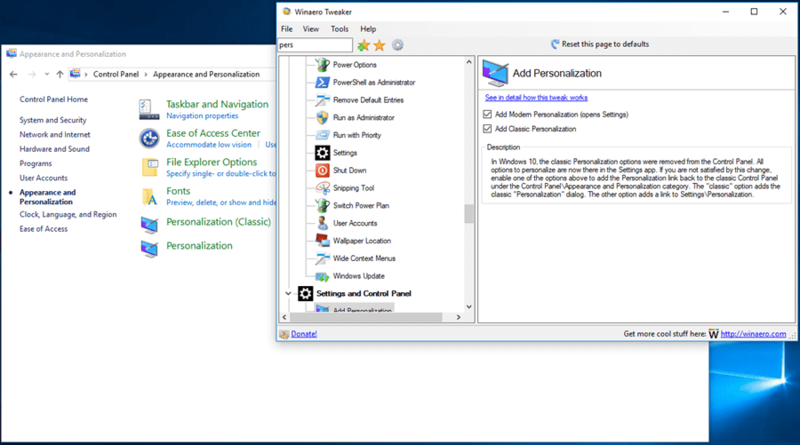 Fixed: The "Wallpaper location" context menu wasn't working in Windows 7. 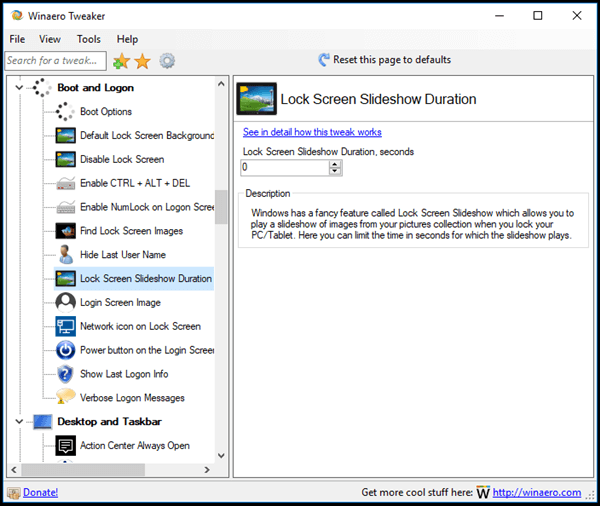 Fixed: The "Elevated Shortcut" feature wasn't working in Windows 7. Fixed: The Control Panel context menu wasn't working in Windows 8/8.1. Fixed: The "Disable wide context menus" feature was reporting invalid status. Also, I've added a "Restart Explorer" requirement. 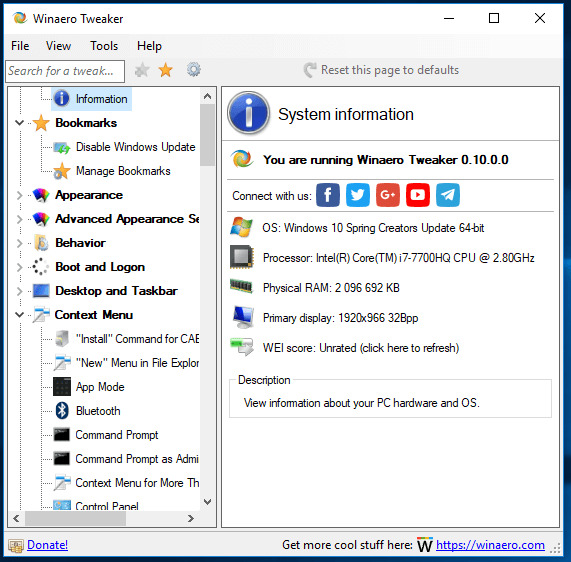 Fixed: The default file name template "Winaero Tweaker_8/17/2017.ini" in Import/Export was changed to "Winaero Tweaker_8.17.2017.ini" for all languages and supported operating systems. Fixed: A "null reference" error message could appear after you remove "OneDrive" from the navigation pane. Updated: The "Enable new share pane" tweak is now removed for Windows 10 version 1703 and above. Updated: The "Enable the new OneDrive flyout" tweak is now removed for Windows 10 version 1703 and above. Updated: The "Enable new share page" tweak is now removed for Windows 10 version 1703 and above. Updated: The tweak "Disable Auto Reboot after Updates" is now removed for Windows 10 version 1709. The key changes of this release. 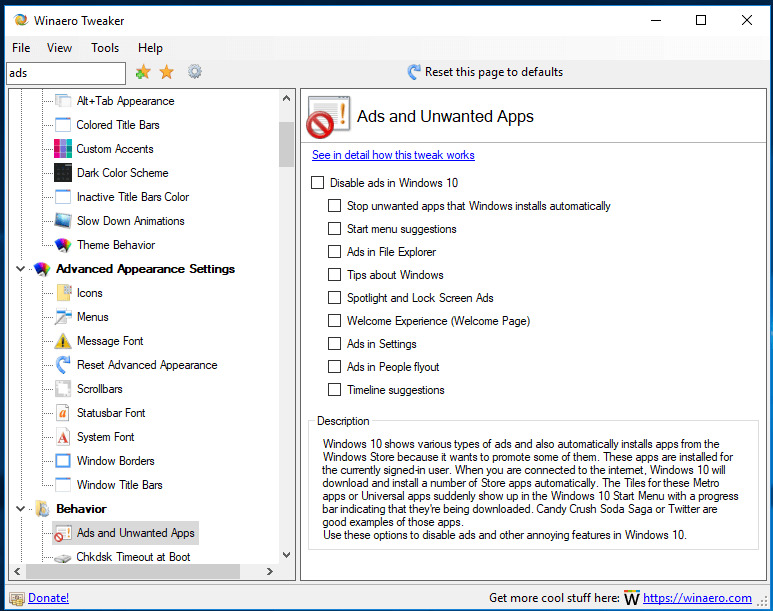 Get rid of ads in Windows 10, including ads in Settings, Timeline, and People. 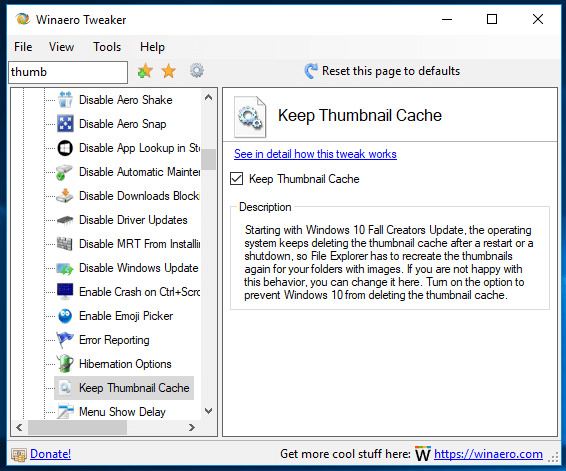 Winaero Tweaker 0.10 allows disabling them. 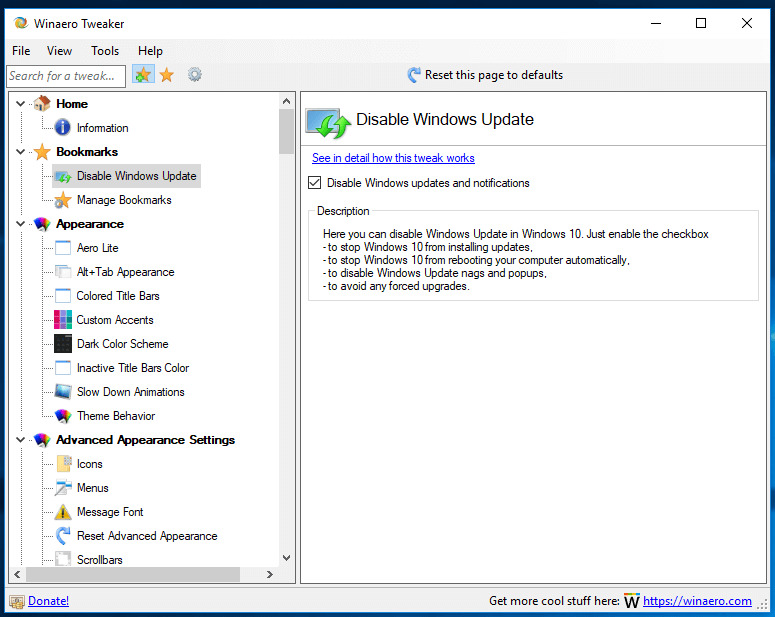 The ability to disable updates and notifications about them in Windows 10. Reliably. The option to add a special sign-in message that will appear for all users every time they sign in. 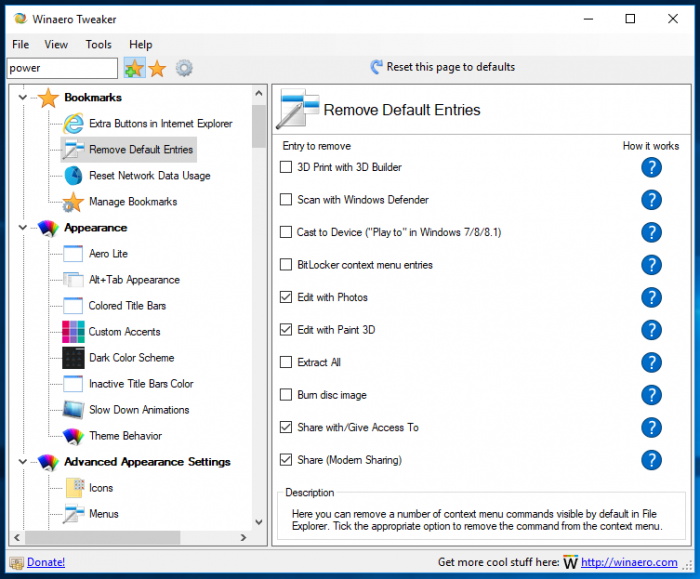 The option to prevent Windows 10 From deleting the thumbnail cache for image and video files. Starting with Winaero Tweaker 0.10, there is a new category of options called "Shortcuts". 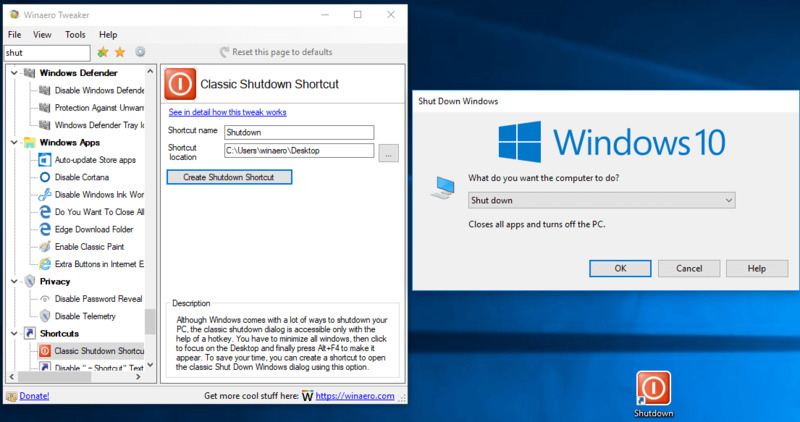 It combines a few previously available options with a new option, "Classic Shutdown Shortcut". 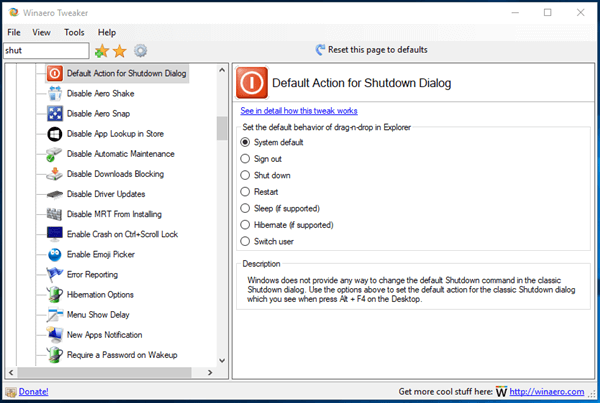 Use it to create a shortcut to the classic Shutdown Dialog Windows dialog. 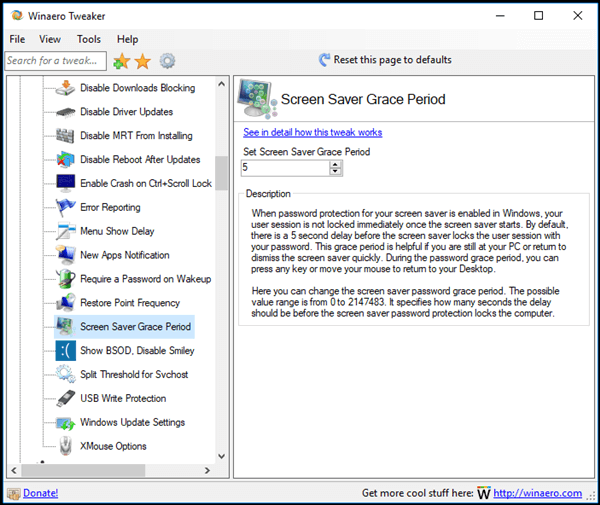 The option to prevent Malicious Software Removal Tool from Installing is now available under Windows 7. Fixed the broken import/export feature for the context menu option "Run command prompt as Administrator". 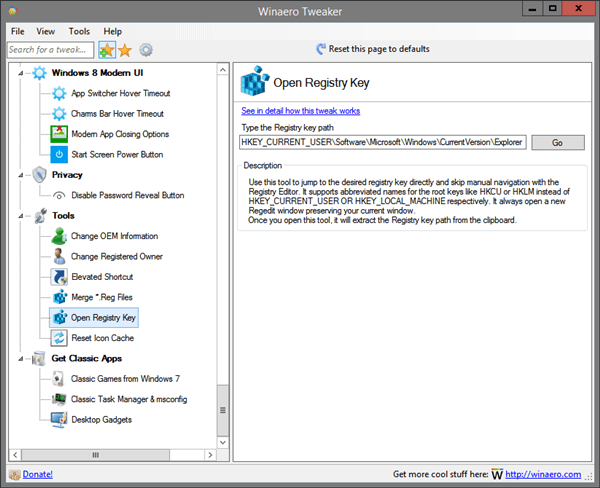 The option "Open Registry Key" now opens the Registry Editor when you hit the Enter key in the text box. The search result pane and the category view now use double-click to open items. 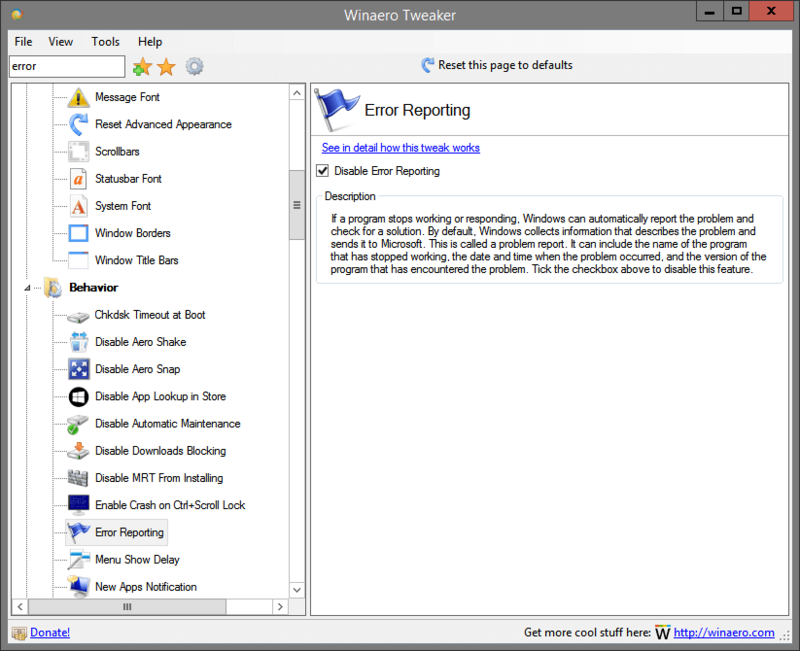 Winaero Tweaker now remembers the collapsed state of nodes in the navigation pane between sessions. A new version is here. * The "Elevated Shortcut" feature now allows specifying and changing the full path to the LNK file. * The Disable Windows Security Center tray icon feature now supports Windows Security. 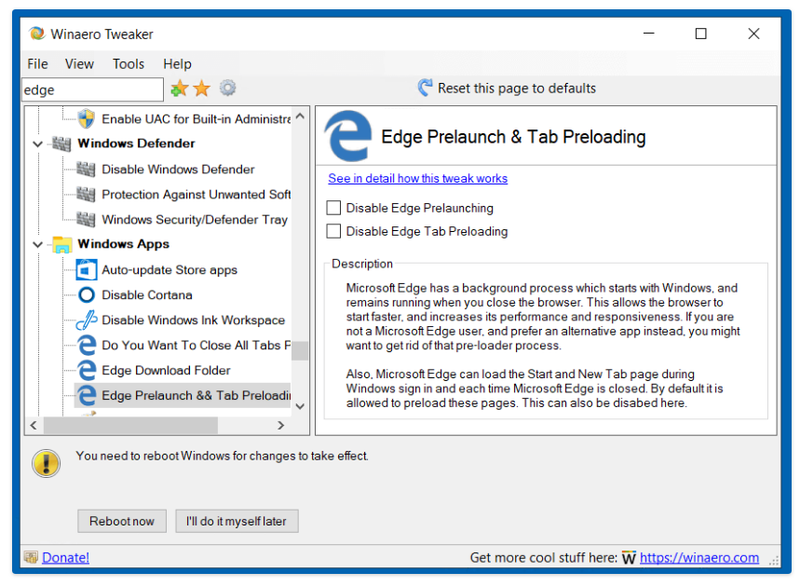 + Allows the user to prevent Windows 10 from reinstalling built-in apps. 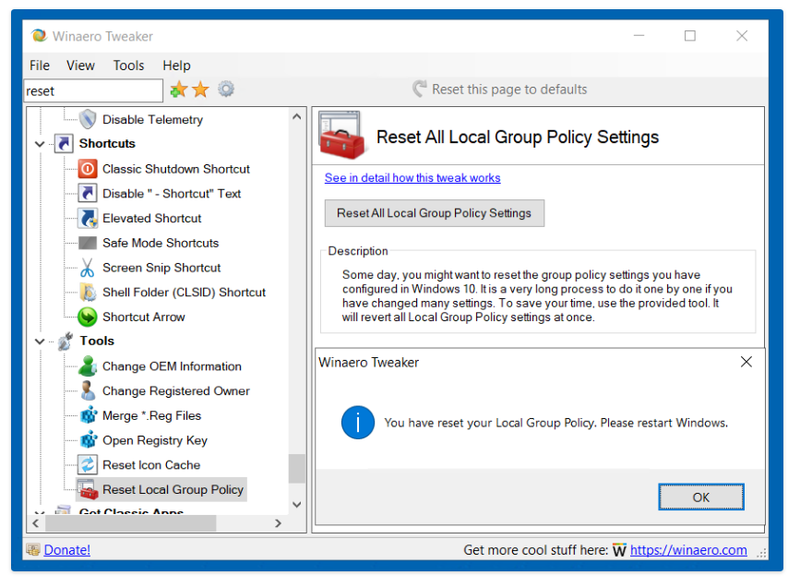 + You can reset all the changes you made with Local Group Policy Editor or manually by editing the Registry.